[sh-man-tra] is an Australian four piece, consisting of Matt Seldon, Thorin Kerr, Alex Hole, and Michael Lenton. They play bass, guitars, keyboards/synths, drums and they sing. 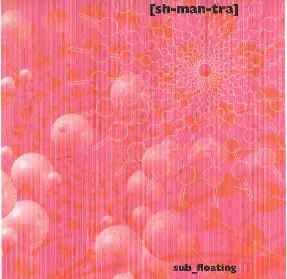 The tracks on sub_floating are improvised and are parts of an almost 65 minute jam recorded live in the studio. They have released 2 other cd’s which are not improv in nature. There are just three tracks on this cd: 5, 13 and 20 minutes. "Floating" (5:48) - Very busy. Lots of stuff going on: big keyboard chords, lots of drumming. Sounds like a determined keyboard workout. "Clam" (13:26) - Nice outer space intro. Beautiful spacey guitar is slowly mixed in. Lots of echo, creating a nice wave motion. There is a nice gradual build, but it never gets aggressive. "Head Hurts" (20:25) - This one starts out very intense, with distorted guitars and lots of noise. Gradually the noise gives way to a nice spacey guitar set; a little echo, some reverb on the guitar. Nice and soothing. This actually lasts for a little while, but then some rhythmic noise is brought in over the guitar. This finishes out the song. Altogether a pretty enjoyable CD. Very interesting in places and just easy to listen to in others. For more information you can visit the Sh'mantra web site at: http://www.shmantra.com. Contact via snail mail c/o Alex Hole; 58 King St; Dundas; 2117; NSW; Australia.